Want to make an easy DIY pillow from a towel? Here’s how to do that without sewing! In case you haven’t heard, I don’t like to sew. Unfortunately, I really like throw pillows. It was always a bad combination until I found no-sew iron adhesive tape! Hallelujah! 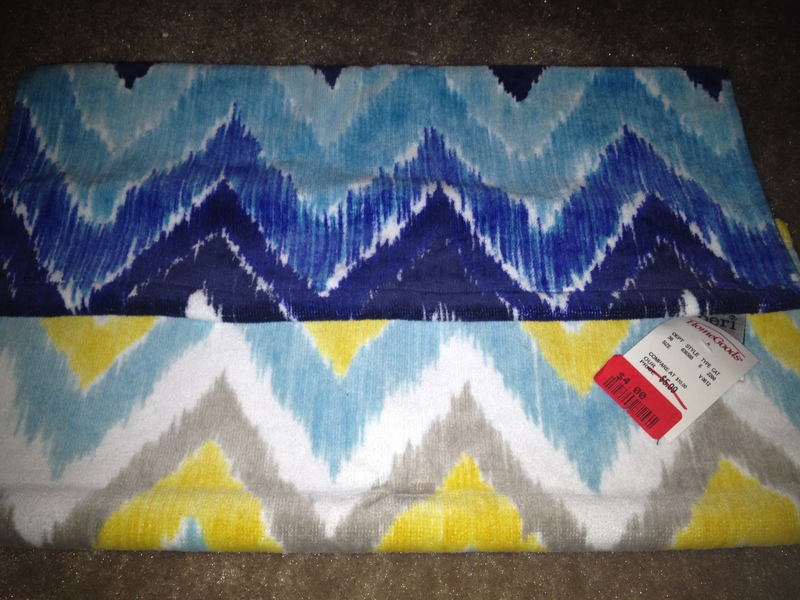 I’ve been pinning a ton of pillows lately, most of which I stalk on flash sale sites like One King’s Lane and Ideeli. Do you do flash sales? Which are your favorites?!? So, when I saw this dish towel on the sale rack at Marshalls, my heart lept with joy. 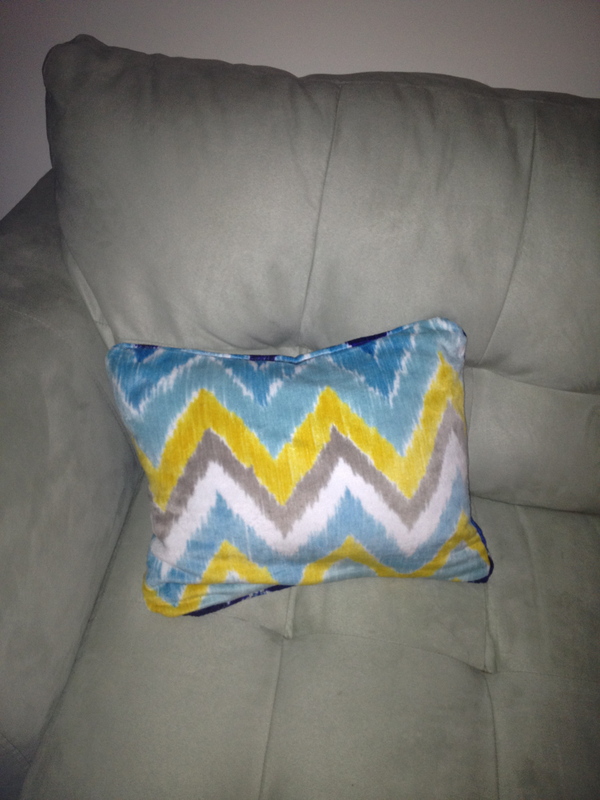 It’s an awesome, vibrant chevron that is an ombre of blue on one side and a gray/yellow combo on the other. Well, actually, I first saw the same pattern in little square towels. for $2 each! I toyed with the idea of using two to make tiny pillows, but once I saw this larger hand towel for $4, I was truly sold. Then all I needed was a pillow form. Unfortunately, Marshalls didn’t have any pillows on sale. They had tons for full price, but I’m really not down to spend $15+ on a pillow I’m just going to cover. Isn’t he ugly? He’s scratchy and tacky and weird. But he’s $3 and the exact size of my towel. HALLELUJAH! So, I used the same technique that I used on my window curtain to iron the seams closed. I first folded the entire towel in half (wrong-side out) and ironed in a seam so that there would not be one side randomly without a seam. Nobody can resist a good craft! I then folded in the two short sides and ironed their seams closed as well. 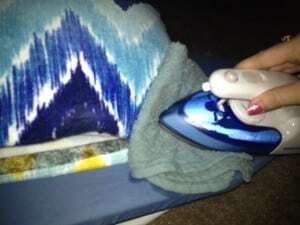 It looks much crisper if you iron over the hem to create a fresh, clean edge before ironing it closed. Finally, I shoved the pillow in and ironed the final side closed. This was the hardest since the pillow was in there and the way I folded the towel made it extra thick. 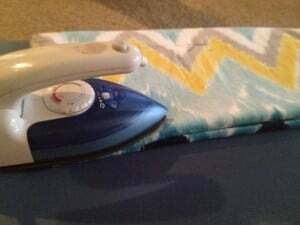 Just use plenty of seam tape and keep your towel nice and wet and it will glue together, no problem. Ta-da! I am SO HAPPY! Can you beleive this project only cost $7 and took less than an hour? 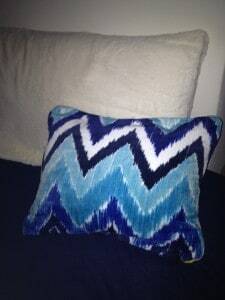 I’m excited to be able to use it in my blue-green living room, navy blue guest room, AND grey and yellow bedroom! Do you sew? Any low cost projects lately? Happy crafting! 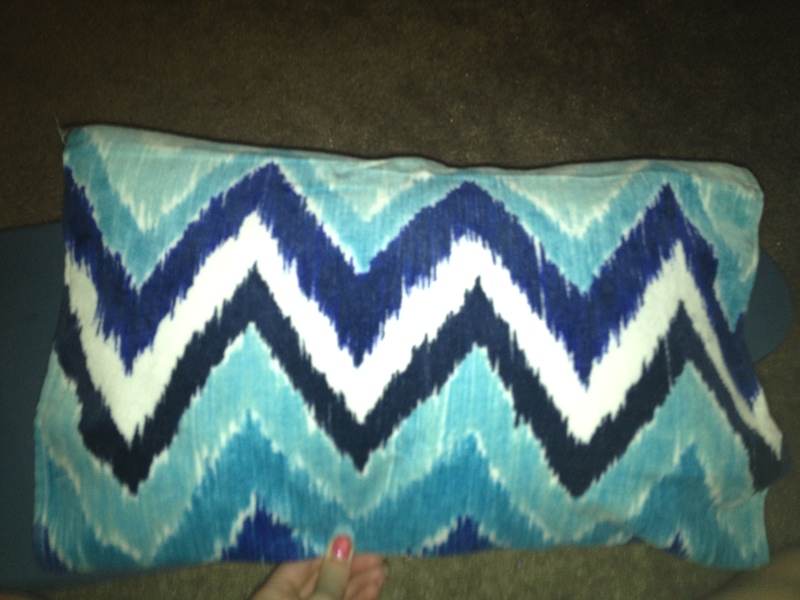 Be sure to follow me on Pinterest and check out other pillows I am swooning after on my pillow board! « Taco Thursday: Oh no! Morgan’s out of town!!! LOVE it! and the no sew part….that’s even better! I have used a sewing machine enough to know I never want to do it again….so this is a perfect item for me to make 🙂 Thanks for posting!! Thanks! 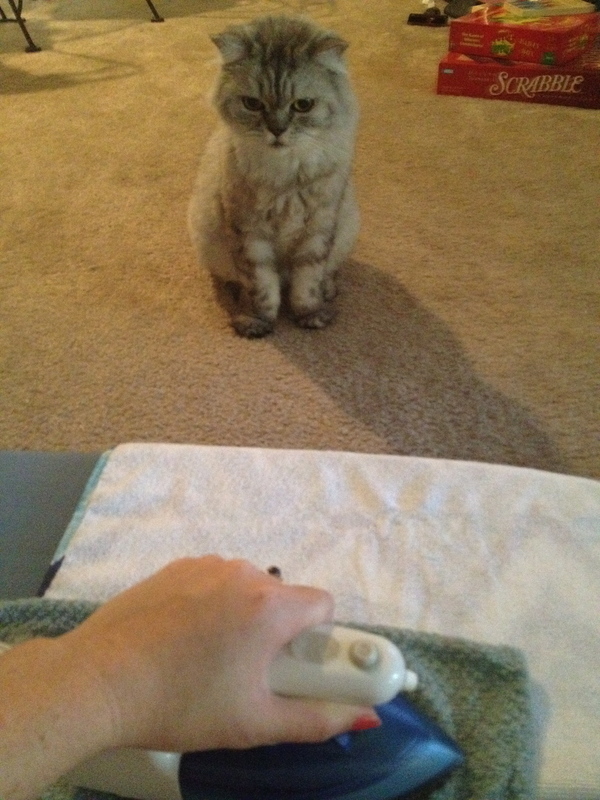 I have a battle with my sewing machine every time I use it so this is a great alternative! I’d love to see yours after you try it!